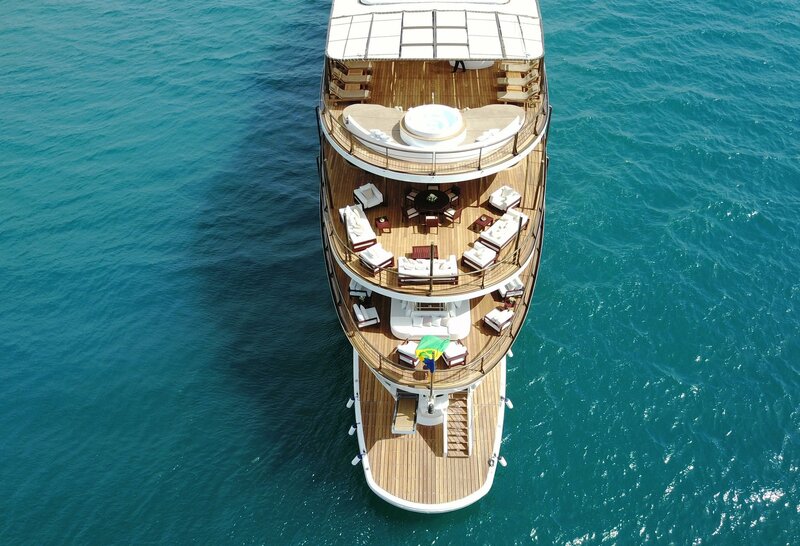 A true floating pleasure palace, 282ft (86m) CHAKRA was completely converted in 2017 and provides her 40 charter guests with an absolutely incredible onboard experience, from health and wellbeing to gourmet cuisine during their charter in the Mediterranean or Caribbean. 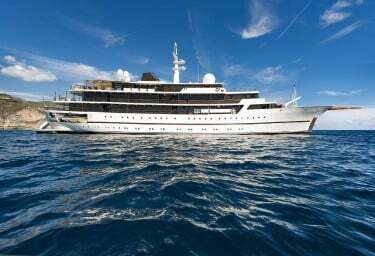 More a ship than a mere yacht, CHAKRA began life as a commercial vessel before being converted into a lavish superyacht at Devonport Yachts. 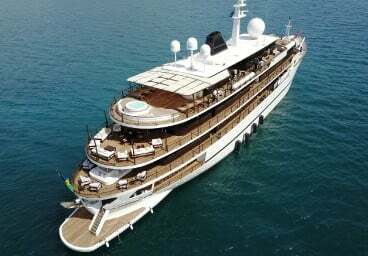 Today, she is without peer one of the largest luxury charter vessels available in the international fleet with a head-turning presence in every port. Her classic exterior belies the ultra-modern interiors and amazing facilities onboard, including massive deck spaces over five levels. 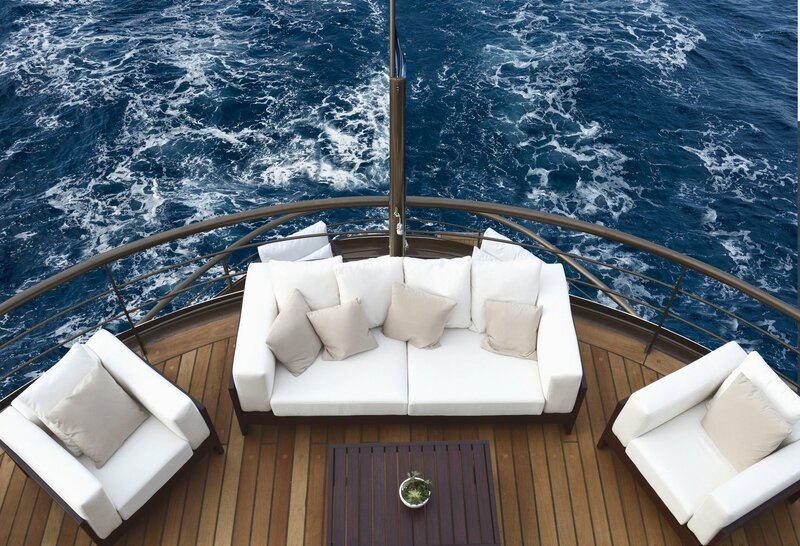 From the top, CHAKRA’S bridge deck ideal for entertaining and enjoying the passing panoramas. 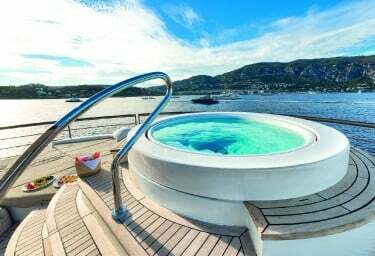 On the aft deck, there’s a jacuzzi, bar, lounges, sunpads, sofas and tables arranged in various sections and covered by an elegant shade cloth. 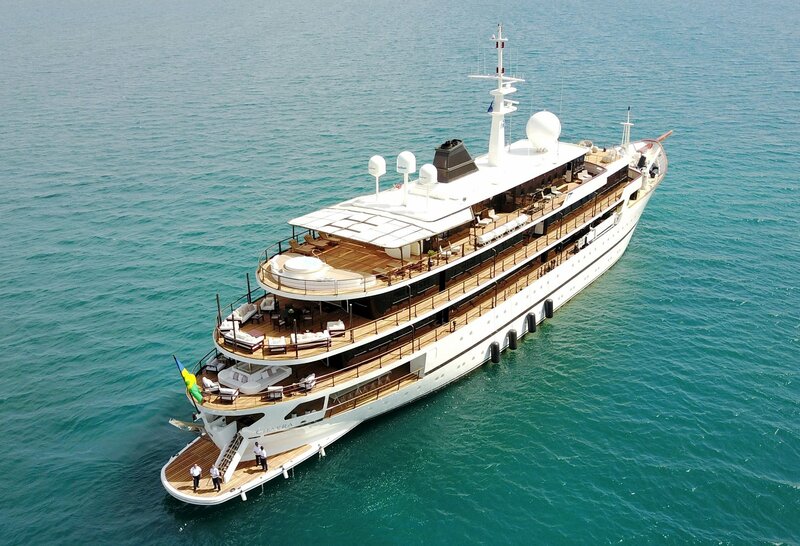 Forward is an enclosed gym with full-length windows and fully-equipped with Italian-made Technogym gear. Wraparound decks lead forward, past the gym, to an open space ideal for yoga, as well as a smaller seating area for intimate gatherings. 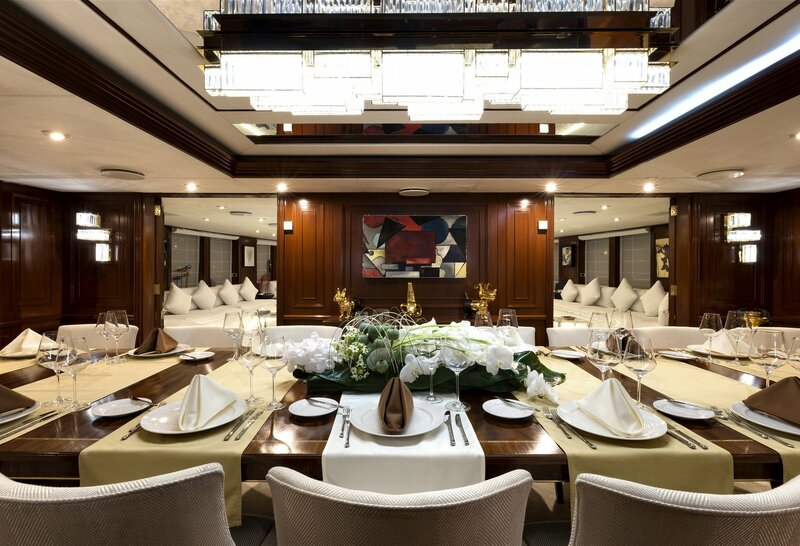 The main deck aft comprises an alfresco dining area for 32 guests, with a bar displaying CHAKRA’S historic steering wheel, and two long glass tables accompanied with transparent polycarbonate chairs. 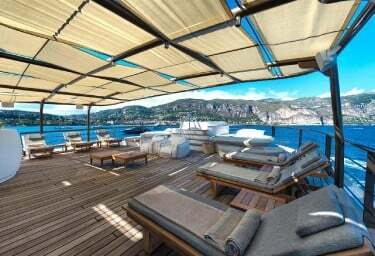 This area is completely protected from the elements, without losing any of the view. The upper aft deck is also shaded by the overhang of the sundeck above and boasts circular table and seating for alfresco dining. 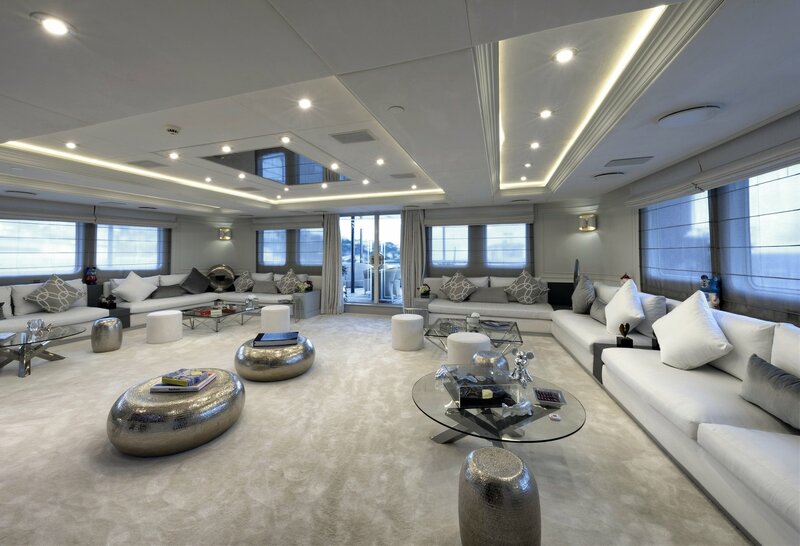 This area has sofas and armchairs, perfect for casual meals and socialising. At the stern of this one-of-a-kind charter yacht is her extended swim platform for easy access to the garage and watertoys, stairs to the deck above, as well as passarelle for ease of boarding guests and their luggage. 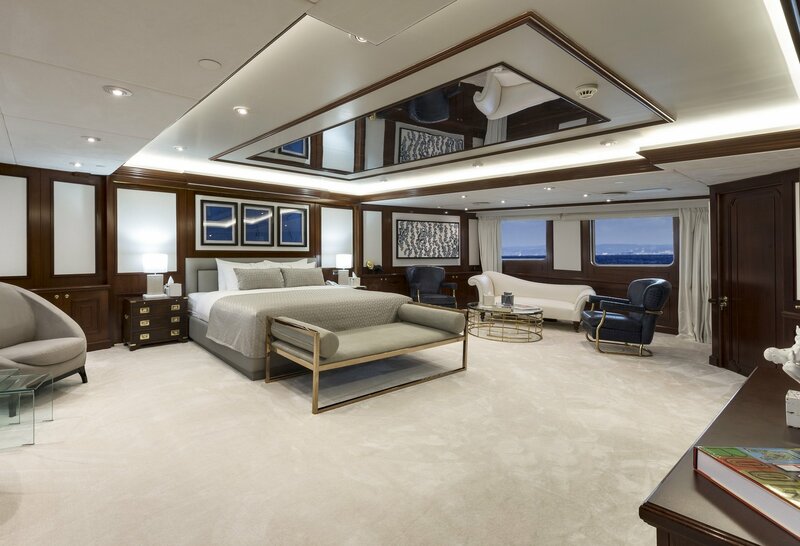 The refit of this superlative charter yacht retained many of the classic heritage features, such as the dark, lustrous timber work within, while infusing it will an impactful contemporary style throughout. 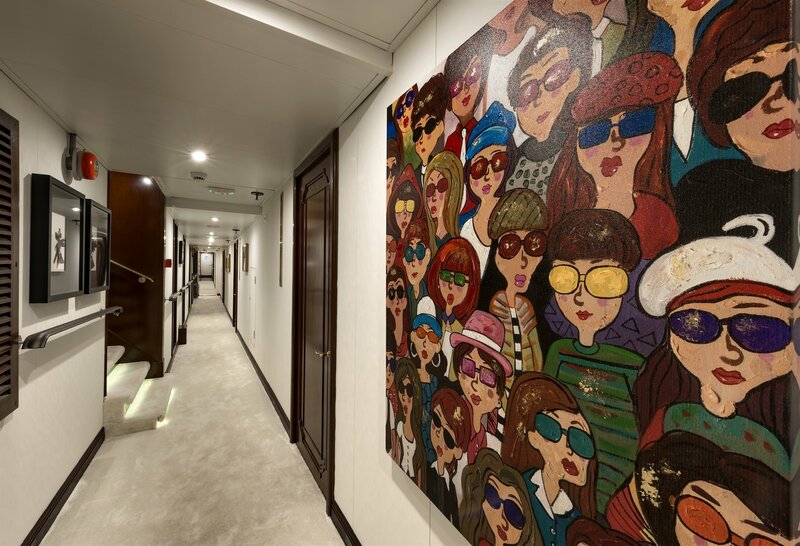 For all her massive spaces and 5-star design, CHAKRA exudes a cosiness through skilful placement, which with quirky artwork and sculpture, thoughtfully placed nooks and equally impressive statement furniture create a warmth that will inspire and soothe her guests. 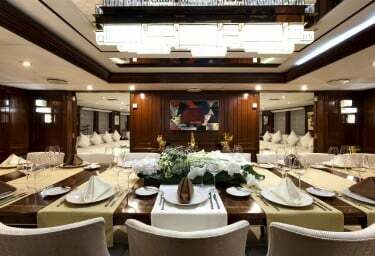 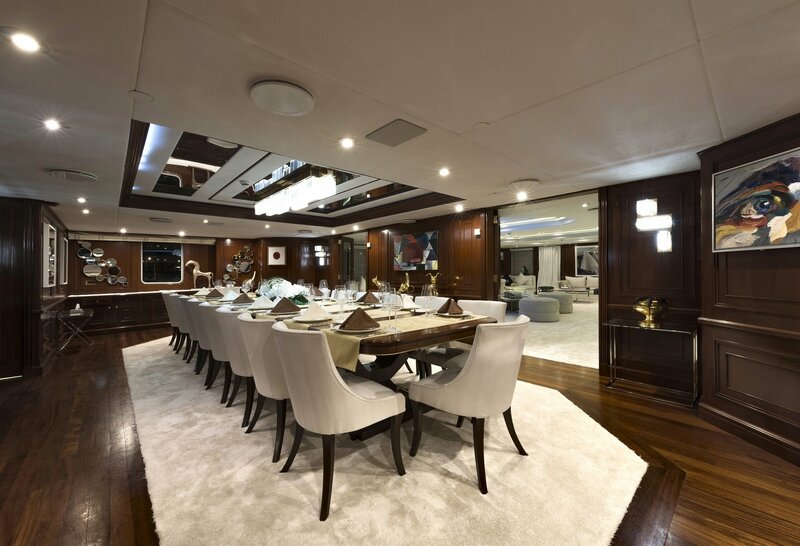 The upper deck features the main saloon which is impeccably styled with an opulent formal dining space that can be closed off with grand dining table and seating for 18 guests, games section with ottomans and a chess table, white lounges with marble coffee tables and TV/AV subtly in the mix. 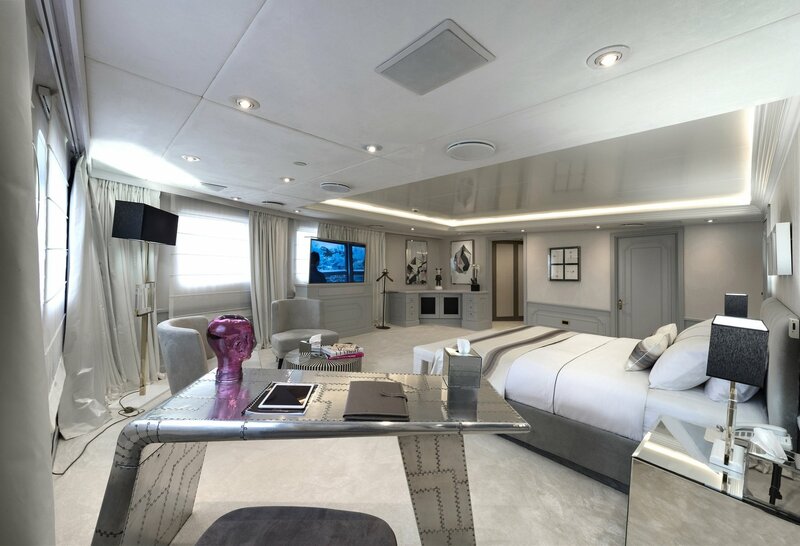 For guest entertainment, CHAKRA has Samsung flatscreen TVs in cabins and social spaces, a Karaoke touchscreen system an Kaleidescape video/music on-demand. 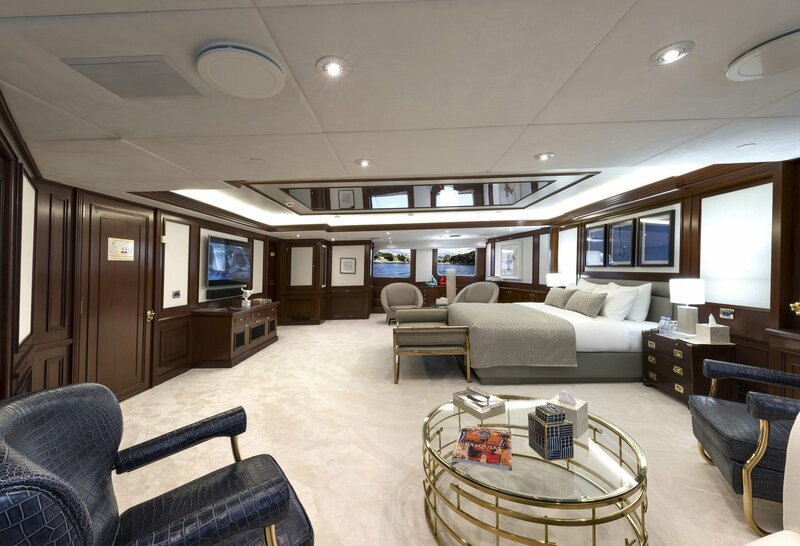 From the main saloon, a corridor leads to the main lobby and staircase to the other decks, and the forward section of the main deck where six staterooms, including the master suite are located. 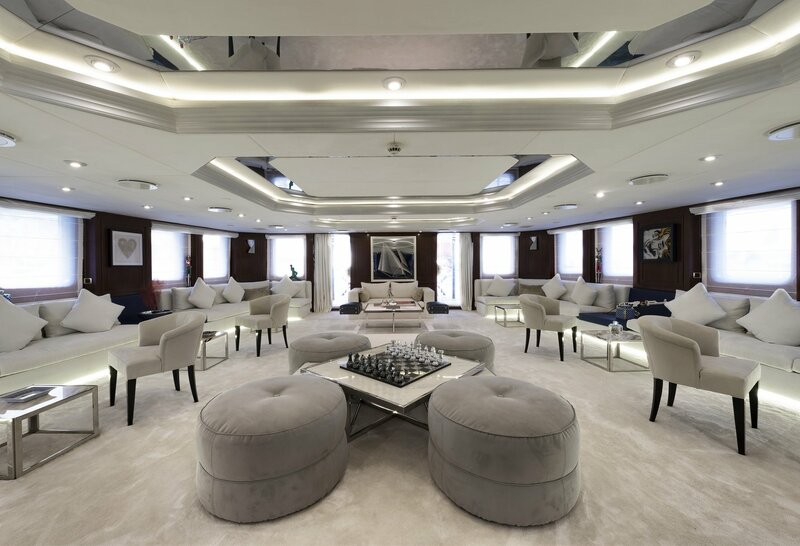 On CHAKRA’S upper deck, there is a bar and lounge area which flows into a club area with sofas and tables similar to the main saloon. 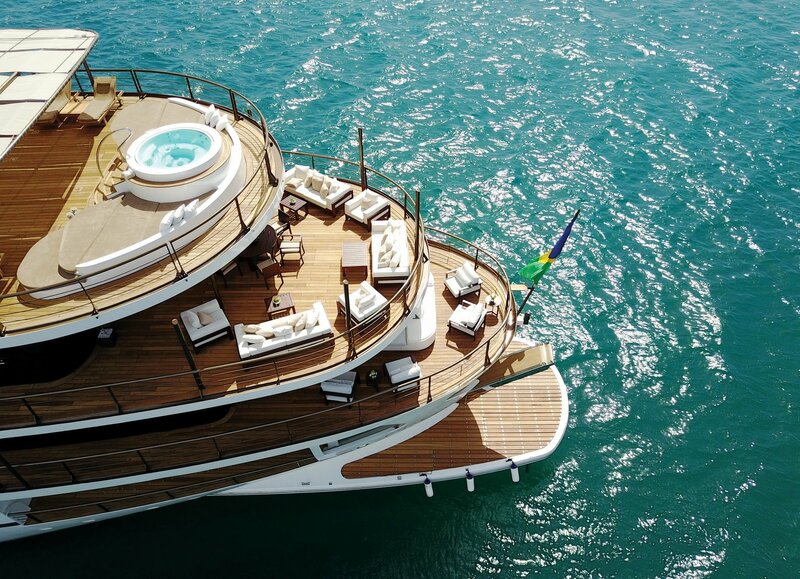 At night, the dynamic space transforms into the social hub of the vessel. 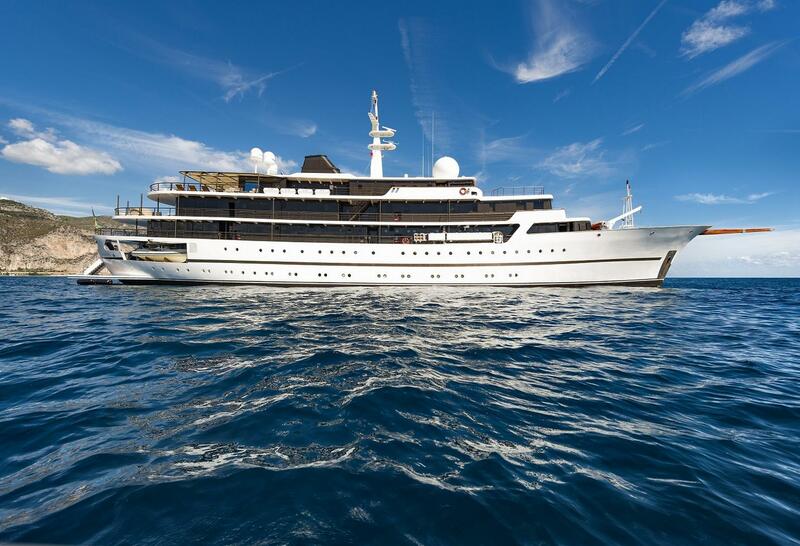 CHAKRA accommodates up to 40 guests in 21 cabins. CHAKRA’S giant proportions means that none of the guest accommodation is located below the waterline, so every guest has the pleasure of waking to sea views, natural light and refreshing breezes. 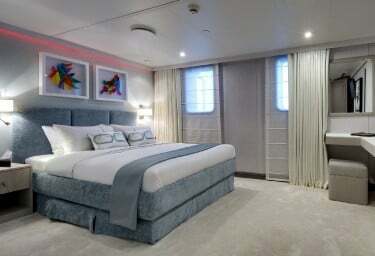 Her 18-stateroom layout means there is an incredible number of options when it comes to the sleeping arrangements. 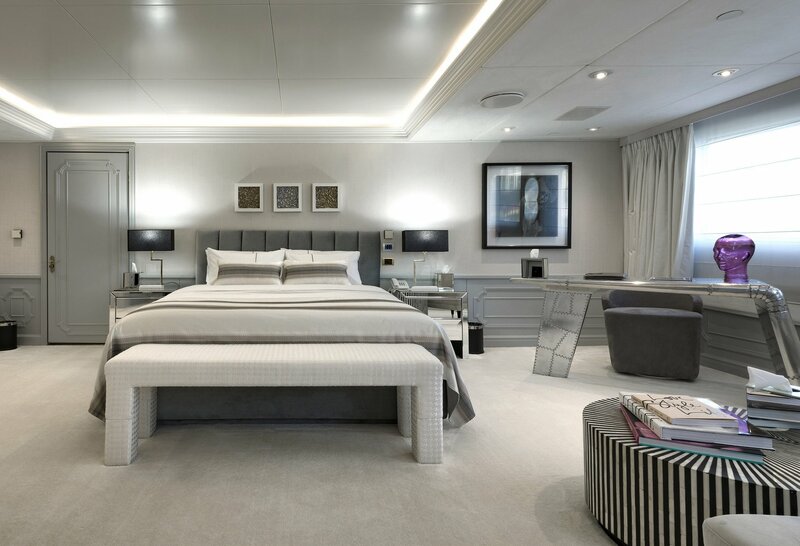 On the main deck, there are six staterooms, including the master suite. The magnificent master suite comprises a king size bed, lounge, private office, large dressing room and generous ensuite with his and her basins, large shower and bath tub for absolute relaxation. The décor is characterised by dark wooden cabinetry, offset with cream carpet and white highlights in the furnishing and linen, along with bold original artworks. On the upper deck forward is the full-beam VIP suite, decorated in soft blue and light, with king size bed, widescreen TV and a curve of windows, silver desk and side tables, comfortable arm chairs, beautiful art and spa-like ensuite. 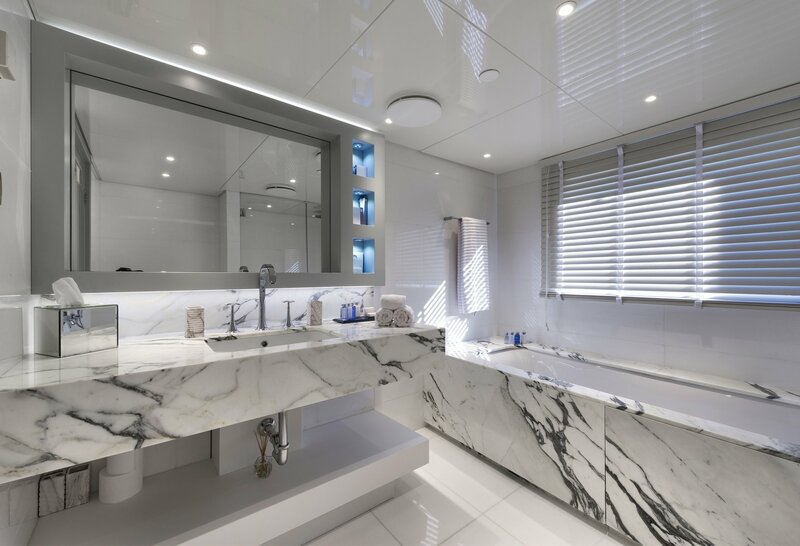 This tranquil colour palette of turquoise, grey and white is used across the guest staterooms, providing peaceful retreats for CHAKRA’S guests. 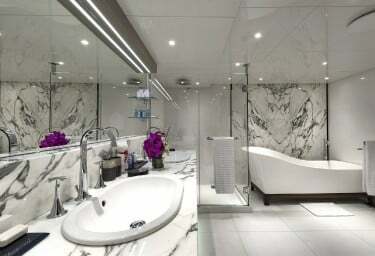 As well as accommodation on the lower deck, CHAKRA boasts a dedicated massage room, spa and hair salon. CHAKRA’S complement of watertoys is equal to her size and stature and will thrill guests keen to take to the water during their charter – whether that’s sedately dipping a toe in, jetting along the surface or diving the depths. Onboard CHAKRA are a Sessa Marine Key Largo 36ft chase vessel plus a 4.2m tender, two Jet Sea Doo GTX 260 limited, one Yamaha VXS wave runner, Flyboard spark, tow tubes, ski, mono ski, wakeboards, wakesurfs and scuba diving and snorkelling equipment. 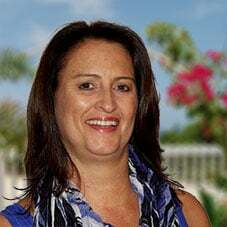 The experienced Captain leads a professional crew of 30, who like CHAKRA work like a finely-tuned machine to deliver a sublime charter experience that exceeds her guests’ dreams.